Coverage Counselor helps drivers determine how much car insurance policy they need. It explains their personalized coverages and the reasoning behind recommended amounts so that they can make informed decisions. By doing so it reinforces the honest and transparent image of the company. Majority of consumers want a detailed quote, not solely a cheap one. With users seeking to understand their quote, there’s an opportunity to provide more information rather than fast-track the process. Improve the appeal of Coverage Counselor and how it would affect likelihood to purchase. Redesign the UI and interactions to feel up-to-date and intuitive based on the logic provided by the product team. Designed UX and UI. Created high fidelity mockups that communicated layouts and interactions. Worked with developers to determine the scope of possible interactions. Provided the user research team with interface options for testing. The flow is divided into 3 parts according the data that needs to be gathered to determine coverage recommendations: you, your vehicle and extras. Users get an immediate feedback during the process by gradually accumulating suggested coverages. Eventually they are offered an option to carry over the info to the quote app and to get a final quote. We conducted a quantitative research to understand user expectations, thoughts and pain points as they were going through the tool. The vast majority thought that the flow was easy to understand, quick, and simple. They were satisfied with the experience and eager to continue to quote. Many were looking to personalize the coverage options even further and see actual prices. 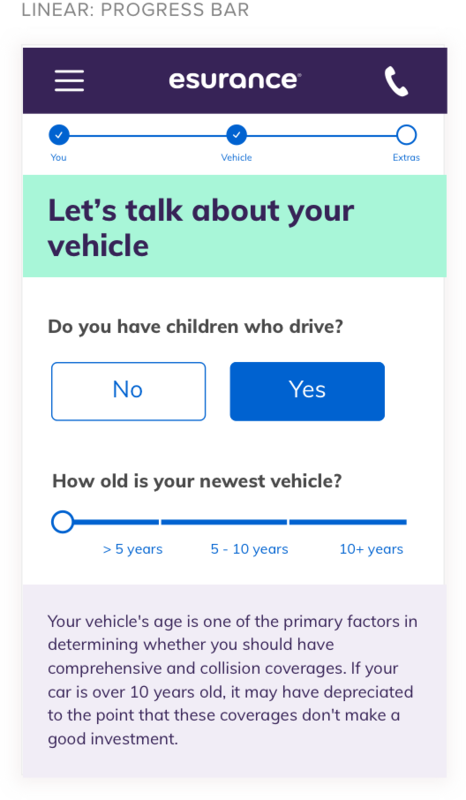 As the app continues to get a high volume of visits (1200 a month) efforts are under way to let the customer customize the coverages even further and to integrate it closer into the policy purchase flow.